Did you learn to play classical piano as a child but would love to play contemporary worship music with ease? Do you already play worship keys but want to extend your techniques and move our of your comfort zone? 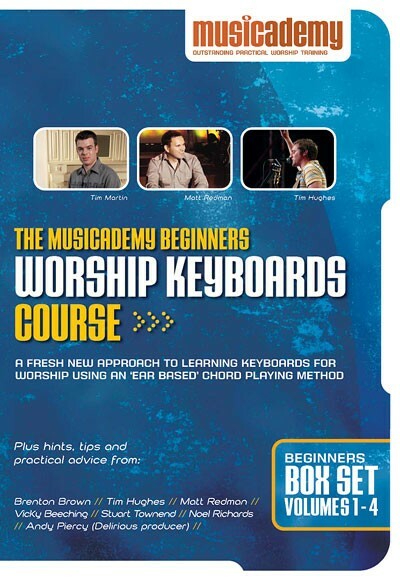 Teaching keyboards for worship with a proven step-by-step chords-based method without having to wade through traditional piano lessons. 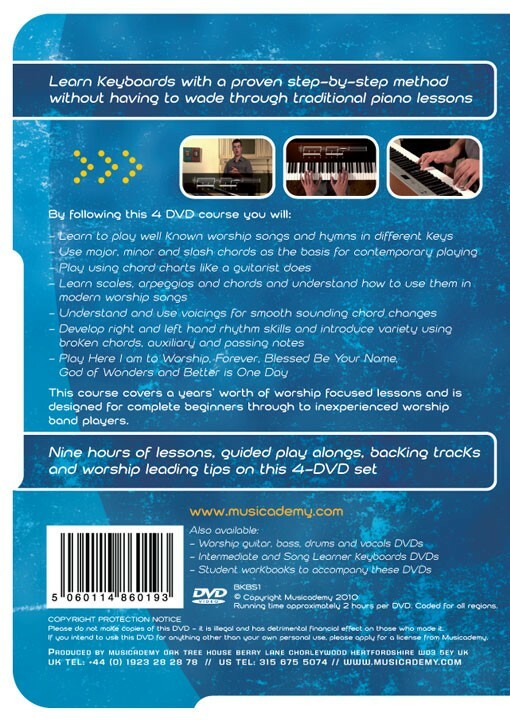 The sampler video above covers both the Beginner and Intermediate Worship Keyboard DVDs. The Beginners set is a 4-DVD box set representing about a year of instruction. Each DVD in the set is at least two hours long. The box set covers over a years worth of worship focused lessons and is designed for complete beginners through to inexperienced worship band players. 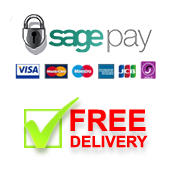 We know these are a fantastic resource and as such offer you a money back 100% customer satisfaction guarantee. As a Beginners course, the box set is suitable for complete beginners who have never touched a piano or keyboard before. Having said that, many people who already play a little, or perhaps learned as children like to start again with volume 1 so that they learn the basics properly. This is particularly important if you have only previously played using the musical score (dots on a page) and are new to our chords-based method of playing. If you are already a relatively accomplished player (i.e. already playing regularly in a worship band - perhaps using the full score) then we'd suggest you go straight to the Intermediate set which begins with really nice simple lesson introducing how to play using chords. If you already have significant classical experiece (say to grade 5 or higher) then we would suggest you first do chapter 1 from the Intermediate DVD set which will introduce you to the chords-based playing methodology and then progress to Beginners volumes 3 and 4 to practice the chords playing with relatively simple pieces. Once you are confident with these you can then return to the rest of the Intermediate set. What is there for people between Beginners and Intermediate standard? Our Song Learner lessons are perfect for people that already know the basics of chords based playing and just want to practice with lots of different songs. The Song Learner lessons are online only (i.e. not on DVD) and sit between Beginners and Intermediate in terms of ability levels. What about the Advanced Worship Keyboard DVDs? These are designed for people who have all the musical know-how from the Intermediate DVD course but want to explore more about differen keyboard sounds. The Advanced DVDs unpack the multiple keys parts to 10 professional worship song recordings so that you can recreate those sounds in a live setting. This is a great course. I have been using it, and it is easy to learn. 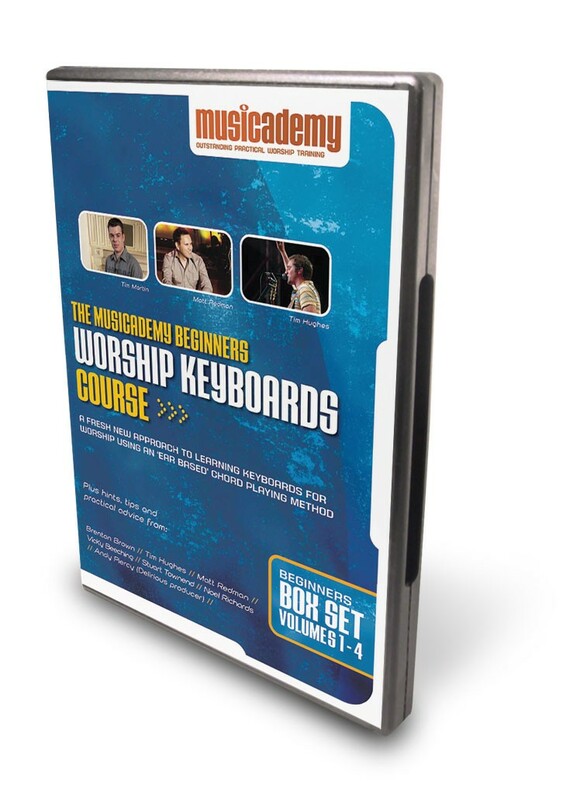 I highly recommend this beginners DVD set to aspiring worship keyboardists. I purchased the Intermediate Box Set too and am looking forward to viewing that. The tutelage is clear, relevant and content is very well produced. I'm really grateful to have found this resource and will definitely recommend it to friends. Well worth an international purchase from NZ. Thanks team. I tried to make my 12-yrs daughter learn piano because our church needs a keyboardist, the current keyboardist will move to other city within few months. Learning to play piano or keyboard is no small undertaking. This DVD breaks it down into manageable steps for the determined learner. 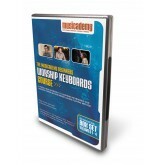 Using a lead sheet/chordal based method, this DVD set helps the novice player learn basic worship songs in several keys. I got this DVDs couple of months back and after few weeks it did simplify things I have always thought complex or fight my head to get it right. This boast my confident in keyboard playing and I am saving for the advance DVD and I hope to get the DVD for base as this is my second instrument. Th instructors were great and I do really wish there were more hymes in this DVDs but however I am glad I got this in my music journey. I have been playing in a praise teM for years but this DVDs help to better me and last summer I was confident to bring kids together to teach them music and able to answer few questions that was difficult for me to explain before now. Lastly I like the facts that is is for christains and by christains. May God grant you guys more grace. I love what you do. God bless. I bought this product a few years ago with the intention of learning to play, I had a little yamaha keyboard, I got frustrated with the feel of the keys and went back to playing my guitar. I recently purchased a piano and thought now what can I do? Sure enough my Keyboard course was sitting on the shelf waiting for its moment. I have been using this now on my piano and it is an amazing product. It's user friendly so you can focus on learning and not on operating the computer or DVD player. Also the pace is really good so you make steady progress. The instructor even encourages you when to stop the DVD and go off and practice. After all practice is what brings it all together. There is also a section on purchasing a keyboard. I highly recommend it. Well done Music Academy!! I am both teaching myself worship music and teaching my students the same concepts. I have found them very helpful in playing in a worship band. I was excited to find myself adequately prepared and ready to take the next step and actually start playing for the band. I recently bought the advanced keyboard DVDs. I already have the intermediate, so this should let you know I have enjoyed both them and the printed music that I can access. The idea of being able to purchase new songs as they come along is also helpful. I find this product very easy to use. The fact that I can pause and practice is an added feature. I have recommended this product to others and hope they will take up the offer.